REGISTER NOW FOR OUR EVENT !!! The 47th ASECAP Study & Information Days will be held on 29-31 May 2019 in the Westin Business Hotel Costa Navarino, Messinia (Peleponnese region) in Greece. The 46th ASECAP Study & Information Days took place from 6 to 8 June 2018 in Ljubljana (Slovenia) on the theme The role of the infrastructure investments in the new EU road mobility package. 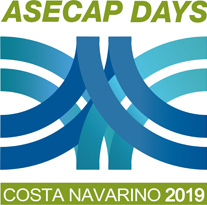 To view the speakers' presentations, please to go the Proceedings page of the ASECAP Days 2018 website. Click on the following link https://louisdavidphotography.pixieset.com/guestlogin/asecapdays2018-ljubljana/?return=%2Fasecapdays2018-ljubljana%2F to view and download the photos. The 45th Annual ASECAP Study & Information Days took place from 29 to 31 May 2017 in Paris (France) on the theme The concession model in the decarbonization era: preparing the infrastructure of the future. Presentations can be downloaded on the ASECAP Days 2017 website under the Programme page. Media coverage of the 2017 ASECAP Days: click here to view and download all the articles. Click on the following link https://louisdavidphotography.pixieset.com/asecapdays2017-paris/ to view and download the photos. The 44th Annual ASECAP Study & Information Days on the theme "The path towards an integrated & sustainable mobility in Europe" took place from 23 to 25 May 2016 in Madrid (Spain). Speakers' presentations / photos are available on the ASECAP Days 2016 website.